Cyril Pope, graduated from Brasenose College, Oxford and was a trainee solicitor. He was sent to the Western Front within days of the start of the war, and was killed in the First Battle of Ypres. Cyril Montagu Pope was born at his parent’s home at 26 Eaton Place, Brighton on 6 August 1888, the eldest son of Reginald Barrett Pope (1858–1913) and his wife Mary, known as Minnie (1859–1921). Reginald Barrett Pope came from Bletchingley, near Redhill in Surrey and married Mary Richardson Reid on 1 January 1886, at Crawford in South Lanarkshire, close to her mother’s home. He qualified as a solicitor and was in practice in Brighton. The couple’s first child, Elsie, was born at Brighton in March 1887, with Cyril being born 17 months later. There were four further children to the marriage, two sons and two daughters. Cyril was baptised at St Mary’s Church in Kemptown, Brighton (where his father was a churchwarden) on 24 October 1888, by Revd. A.T. Waugh assisted by Revd. Gerard M. Halton, vicar of St Mary’s. By 1901, the family had moved to a larger home at 41 Sussex Square in the Kemptown area of Brighton. Ten years later, the family were still living at 41 Sussex Square with three servants, including their 40 year old cook, Frances Loten, originally from Hillands Farm near Elsted in Sussex. By the time of his death on 13 June 1913, Reginald was in partnership with Wilson Stuckey and the firm was known as Stuckey, Son and Pope, solicitors, practising from premises at 4 Prince’s Place, Brighton. Cyril first attended Temple Grove, a preparatory school at East Sheen in south-west London, before winning a scholarship to Winchester College in 1902. 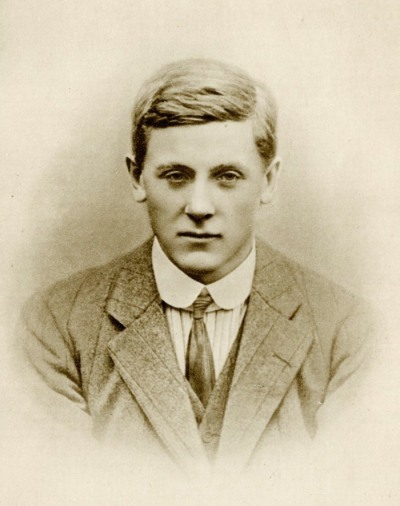 At Winchester, he was appointed a school prefect in 1906 and in 1907 he won the Duncan Prize for Reading. He was also a keen sportsman, playing in the school rugby XV and shot for the college’s Wimbledon VIII. He left Winchester in 1907 with an exhibition for Brasenose College, Oxford. At Brasenose, he successively held a Hulme Exhibition and a Senior Hulme Scholarship. He obtained a second class in Moderations (after five terms of a 4 year, 12 term course) and graduated in 1912 with a second class honours degree in “Greats” (mainly the study of classics) and in jurisprudence, followed by his BCL (Bachelor of Civil Law) in 1913. At Oxford, he continued with his sporting interests and was stroke for his college in the 2nd Torpid and the 2nd Eight in 1911, and for the 1st Torpid in 1912, in which year he again rowed in the 2nd Eight. He also played association football for his college. On graduating, he joined his late father’s firm, now Stuckey, Pope & Carr, and was in the second year of his articles at the time of his death. Reginald Barrett Pope was a freemason, having been initiated into Royal Clarence Lodge No 271 at Brighton in February 1895. Cyril was initiated into Royal Clarence Lodge a few months after the death of his father, on 17 October 1913. He was passed to the second degree on 21 November and raised to the degree of a Master Mason on 19 December. In 1910, whilst at Oxford University, Cyril had obtained a commission as second lieutenant (on probation) with the 3rd (Special Reserve) Battalion, The Oxford & Bucks Light Infantry and was confirmed in this rank on 2 December 1911. On 26 November 1913, he was transferred to the 5th (Special Reserve) Battalion, The Worcestershire Regiment, being promoted to lieutenant a week later. Following the declaration of war, Cyril was attached to the 2nd Battalion of The Worcestershire Regiment for duty from 5 August 1914. The battalion was part of the 5th Brigade, 2nd Division and proceeded to France with the BEF, landing at Boulogne on 14 August 1914. The battalion were immediately in action in the Battle of Mons on 23 August, followed by the subsequent retreat. The battalion was continually engaged in the major early battles of the war, fighting in the Battles of the Marne and the Aisne in mid-September. In October, the battalion was sent to Flanders as part of the force attempting to prevent the Germans reaching the English Channel ports. On 24 October, the battalion fought a desperate action in Polygon Wood, to the north-east of Ypres. In hand to hand fighting, with bayonets and swords, the Worcesters were able to clear the woods of enemy soldiers, but suffered 200 casualties (including six officers), dead or wounded. 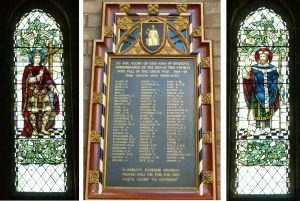 The regimental history, refers specifically to the battalion’s casualties on 24 October as being “easily the heaviest casualties for any single day in the Ypres 1914 fighting”. Over the next six months, Cyril’s grieving mother was engaged in regular correspondence with the War Office regarding the kit and personal belongings of both Cyril, and his younger brother Reginald, who was killed four months later. Although these could both be traced to Southampton, they went missing en route to London and were never returned to her. Cyril was commemorated in the Winchester College war memorial cloister and on the Brighton war memorial. In the family church, St Mary’s, Kemptown, both he and his younger brother Reginald are commemorated on the church’s war memorial and also in stained glass windows, that for Cyril (on the right above), depicting St Wilfrid, and that for Reginald (on the left) depicting St Oswald. In Ypres Town Cemetery, the burials were separated into officers and other ranks, a practice that was soon abandoned with all ranks being interred alongside each other. Close to Cyril’s grave is that for the youngest grandson of Queen Victoria, Prince Maurice of Battenberg, a lieutenant in the King’s Royal Rifle Corps, who was killed near Ypres on 27 October 1914. Prince Maurice was also a Freemason, having been initiated into the Old Wellingtonian Lodge No 3404 in 1912 and installed as Master of the Twelve Brothers Lodge, No 785 in Southampton in April 1914. Cyril’s younger brother, Reginald, was a full-time soldier who served as a lieutenant with the Welsh Regiment in Egypt, Sudan and India before the war. He was killed by a sniper near Ypres on 23 February 1915, aged 23. Having already lost her husband and two sons since 1913, Mrs Minnie Pope suffered further tragedy when her youngest daughter, Constance, died of influenza on 8 July 1918, aged only 19. Minnie herself died at her home at 4 The Cliff, Black Rock, Brighton on 21 November 1921. Her only surviving son, Eric Hamilton Pope (1893–1972), served in the war as a captain in the Royal Sussex Regiment in Palestine. He followed his oldest brother into both the legal profession and into Royal Clarence Lodge No 271, into which he was initiated on 19 November 1920. He is survived by several grandchildren.